A Quebecois animated feature, it would be assumed that English Canada would get the English version. The film opens after premiering at TIFF kids 2018. The film is set in Quebec 1956. 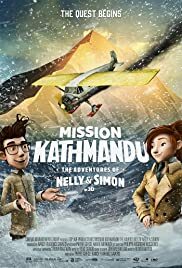 The Nelly and Simon of the title are two friends that embark on an expedition in the Himalayas in search of the Yeti, a sort of missing link. Nelly Maloye is a very amateur private eye who stumbles into the research lab of Simon Picard. Picard is a young anthropologist. Frustrated and nearing the end of his research grant, Simon has yet to find evidence of the existence of the elusive Yeti and prove his hypothesis that the Yeti is the missing link in human evolution. Given a three-month reprieve by his wealthy yet suspicious investor, Simon reluctantly accepts Nelly’s help as they set out on a mission through the Himalayas in search of the Yeti. Using an explorer’s journal that supposedly contains the location of the mythical creature’s den, the two must learn to combine their methodological and improvisational approaches if they are going to be able to navigate the challenging terrain. Nelly and Simon caters mainly for younger kids, judging from the humour. The animated humour contains lots of slapstick (Simon, the sherpa all falling down in the underground cave and swept away in the underground stream; the dancing and laughing Yeti tribe). The characters frequently gesture with frantic movements and there are kid anecdotes like good luck or bad luck story told to the sherpa. The animation looks great, though not concentrating on detail – similar to a cross between the look of the INSPECTOR GADGET cartoons on TV and the look of the Belgium comic book “The Adventures of Tin Tin”. The use of shadows enhance the atmosphere of the private investigator’s world. The film aims at a message (though too obvious) for the younger folk too, that all species (like the Yeti) need to be respected and not turned into a circus. The bad guys are once again the establishment like Simon’s boss and Simon’s financier, Edward who wants to make money from the discovery of the Yeti. Edward is clearly the villain of the piece, and he gets what is coming to him (in slapstick terms) at the end. One wishes that for this grand adventures set in the mountains and with the discovery of a tribe of (Shrek-looking ) Yeti’s, the film could have been funnier. Perhaps the Quebecois jokes did not translate well into the English version. For adults, the film can be a bit childish, especially with the introduction of a rather unfunny chatty myna bird named Jasmin. The film also lags in the middle. Still there is no excuse for an animated feature not to cater to both adults and kids, films like SHREK and even the fairytale BEAUTY AND THE BEAST serving as examples. SIMON ET NELLY is an ok family animated feature but one wishes it could have been catered more to the adults.